A New Earth by Eckhart Tolly is the right book on the right time. Humanity stands on an important crossing. The egoic consciousness has brought the earth and humanity on the edge of total disaster. Therefore it is time for a collective transformation of consciousness, so we will lose our heavy density and become our precious nature who we really are in essence, and so we will become transparent for the Light of pure consciousness. The possibility of this transformation is the message of Light bringers like Buddha, Jesus, and many others. Is humanity more open for this transformation than earlier? What can we do to speed up this process. And how can we recognize this new, awakening consciousness? In a new earth, Eckhart Tolle give you the answers to these questions. This book is truly the instrument for transformation, arising out the new consciousness. When you read the book, you truly will experience the relegation within. In A new Earth Eckhart Tolle explains in an easy to read language that man makes himself constantly unhappy by identifying himself with the ego. Constantly man search for acknowledgement as food for the false self. This way, man experience many strong emotions caused by the wrong assumptions about life, and therefore not understanding the cause of Life. A new Earth is a clear signpost to the new consciousness. It helps you to get in touch with the stillness within, and brings you back to a pure life in unity. Eckhart Tolle is a well know spiritual teacher and author of the books the power of Now, practice the Power of Now and Stillness speaks. He is a prominent speaker around the world who explains in clear and plain words the transformation in consciousness. He has the remarkable gift to explain the madness of the world, without attacking the ego itself. Even average people who aren’t spiritual at all, he can explain the constant pressure of the ego by living in a fake reality. It is an unreal world which does not pour out of God, but is born in the limited thinking of man. That is why he claims man must understand step by step the working of the ego, so he won’t identify himself any longer with a created part in himself that only brings him painful experiences. This part is what Eckhart Tolle calls the pain-body. This pain-body is full with unpleasant experiences from the past, which each time comes to the surfaces. Next man must learn the wisdom of the Christ – Self to awaken to your life’s purpose. … want to understand the ego and wants to develop to a more simple and joyful Being. By reading this book you will experience a shift in your consciousness. Anymore you will feel I – the ego, but rather I and the ego. You will recognize daily situations where you will caught yourself when acting the ego. Let yourself lead trough this book, so you will become the essence of your true Self. Recently Eckhart Tolle gave ten shows on one of the biggest TV – shows in the world, the Oprah Winfrey Show! 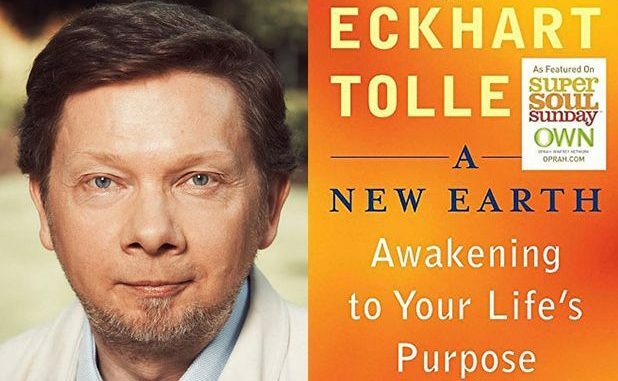 During this online broadcast people could ask questions to Eckhart Tolle about his book.